Back in August, a few days before my birthday, I received a delicate little handwritten letter, with my address scribbled on the front in that delightful wobbly scrawl that seems to be reserved exclusively for the use of the over-80s. 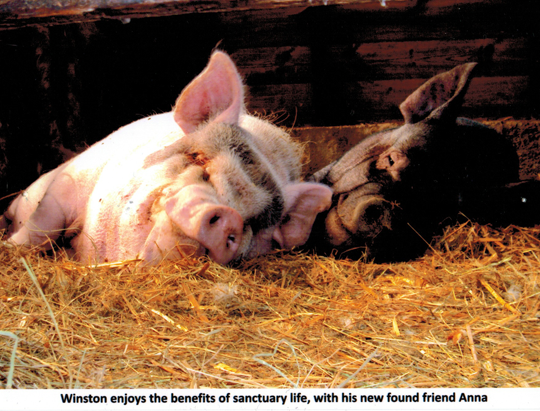 Enclosed was a glossy 6’x4′ of the photograph you see above, along with a letter from a local animal sanctuary, informing me that a pig named Winston had been adopted on my behalf. The name of my generous benefactor was not revealed, so after various familial lines of enquiry drew a blank, I concluded that this must be the idiosyncratic birthday offering of some kindly but obscure relative, who’d taken some long-forgotten comment about my affection for pork to heart and seen the association through to its logical conclusion. That is, until film critic Guy Lodge (whose new Observer column is well worth following) happened to mention that he’d also been sent the gift of vicarious swine, and that he’d traced the present back to Metrodome Distribution, who earlier this summer released Shane Carruth’s fantastic Upstream Colour — a film that, alongside a myriad other mind-bending trains of thought, features an extended riff on the kinship of pigs. The subtlety of Metrodome’s marketing campaign may have failed to produce the desired effect, but at least I’ve released the error of my ways in time to warn you that Upstream Colour returns to a dozen cinemas across the UK tomorrow, for one day only, as part of Picturehouse Cinema’s ‘Discover Tuesdays’ strand. I’ll leave it to you to decide whether or not my endorsement is coloured by my receipt of abstract livestock.